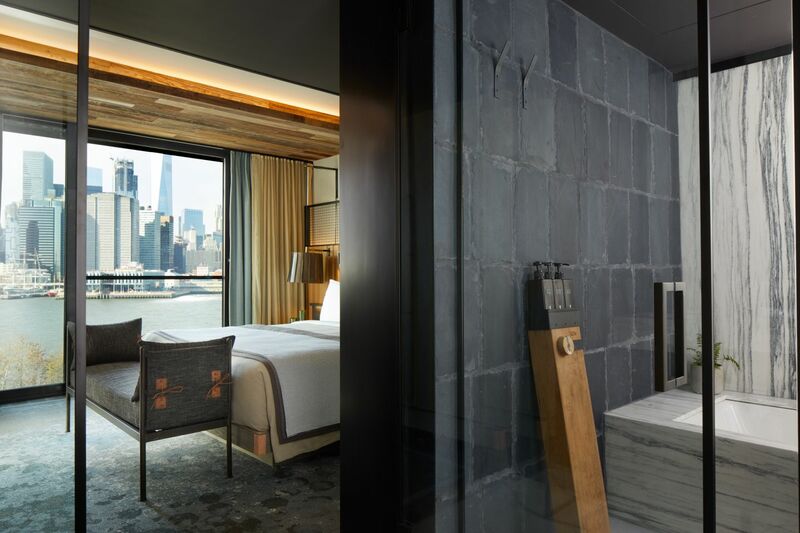 Stepping into the lobby of 1 Hotel Brooklyn Bridge, designed by New York-based architecture studio INC Architecture & Design, provides a familiar, if not expected feeling in the famously hip borough. 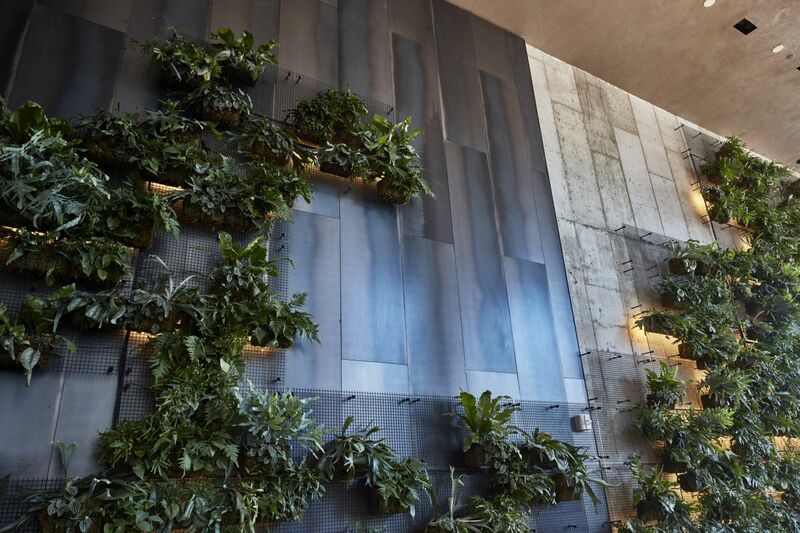 Front and center in the soaring space stand the exposed raw concrete beams and rope-wrapped obsidian that make up an installation by local artist Rachel Mica Weiss. 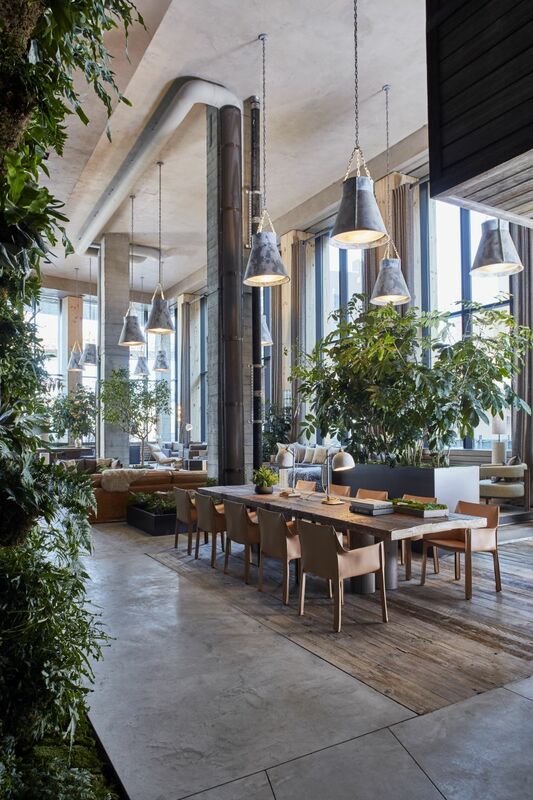 Oxidized steel pendant lamps, designed by the property’s landscape architect, Harrison Green, hang from the rafters, against a background of vines and broad-leafed ferns. 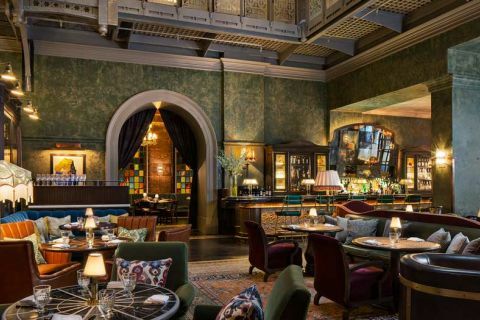 It’s in that setting that local barman Arley Marks mixes up inventive cocktails like seaweed martinis. 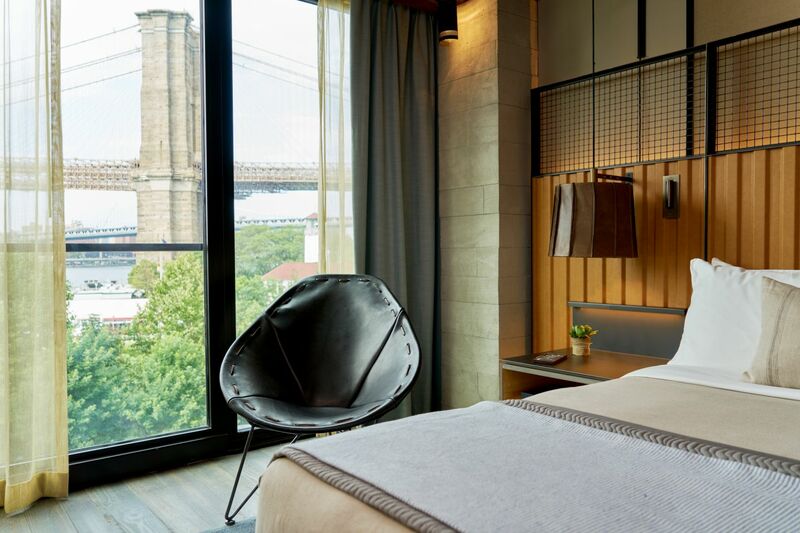 Like the 1 Hotel outposts that have come before it—first in Miami, then Manhattan—the property is loaded with a suite of sustainable features: a rainwater reclamation system that feeds into the park for irrigation during the summer months; wind powered electricity; recycled materials including repurposed wood from the dismantled, centuries-old Domino Sugar Refinery in Williamsburg. 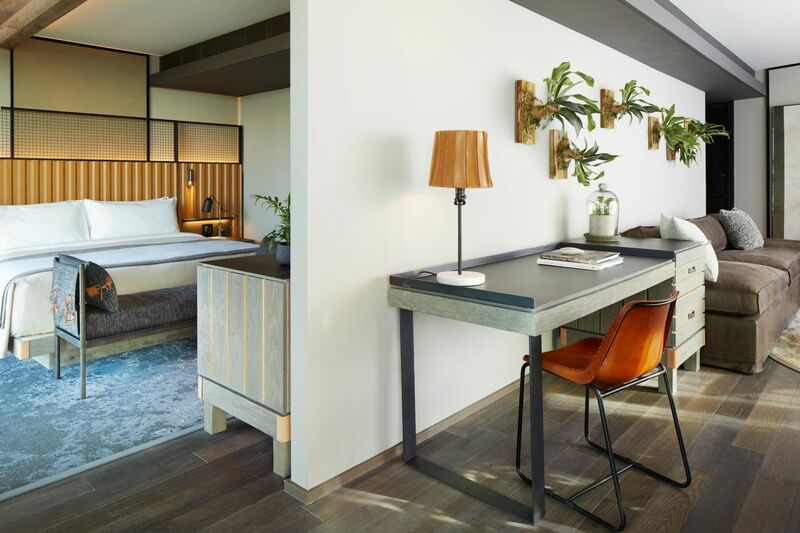 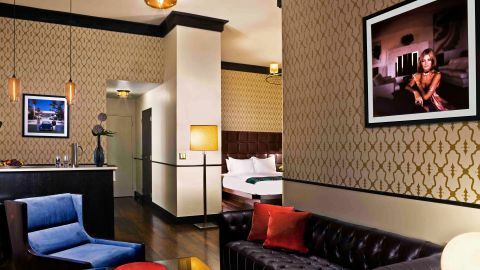 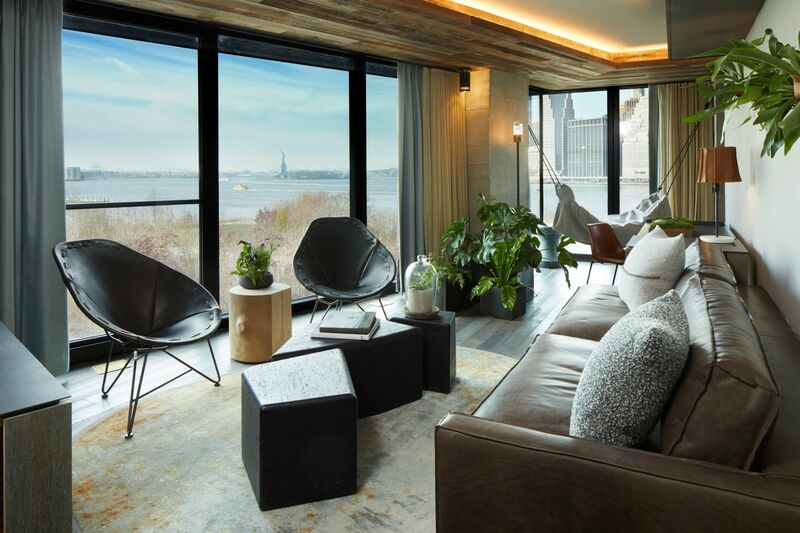 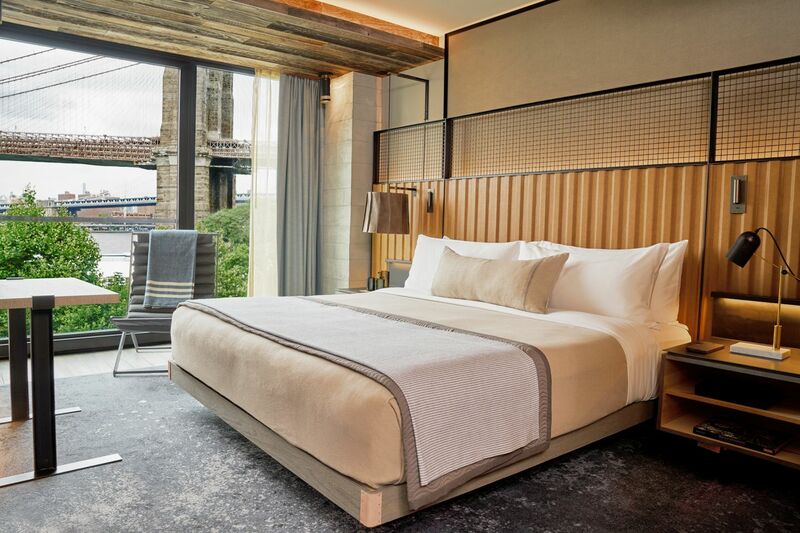 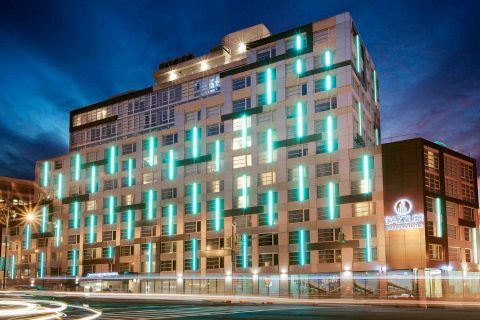 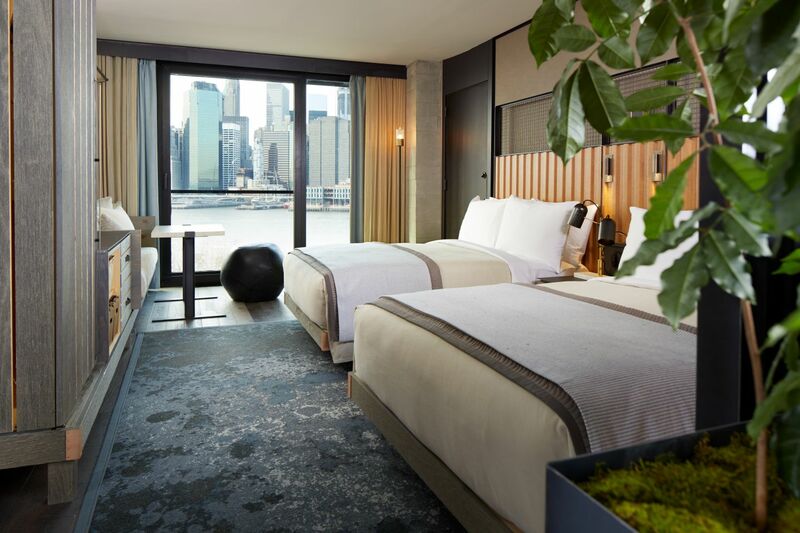 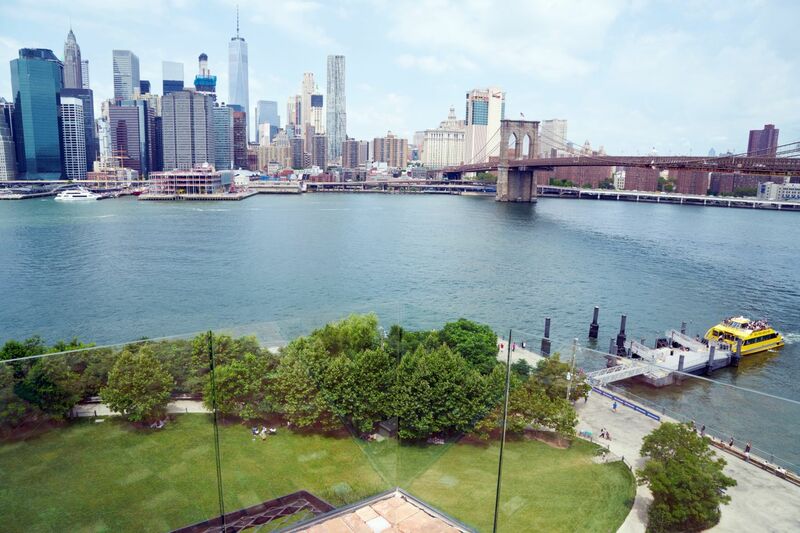 The 194 rooms, including suites ranging from two to six bedrooms, offer views of the Statue of Liberty, Lower Manhattan and the Brooklyn Bridge. 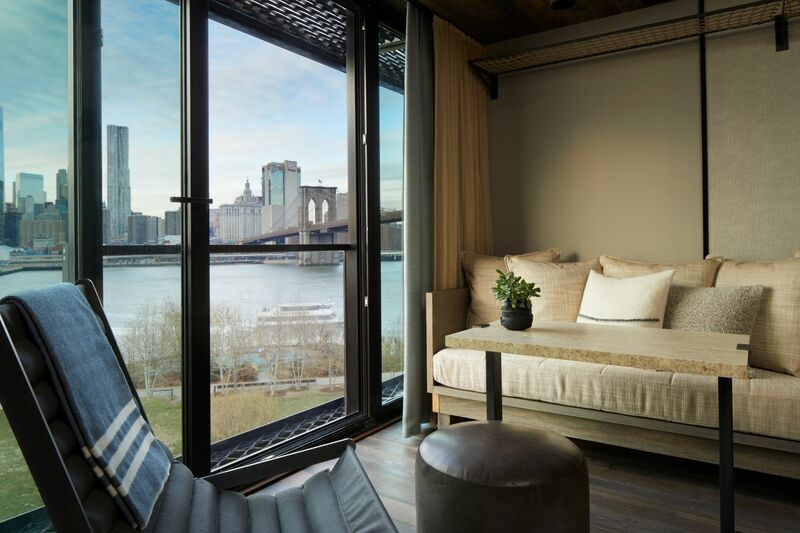 Floor-to-ceiling windows slide open, transforming the space into what feels like an indoor/outdoor balcony. 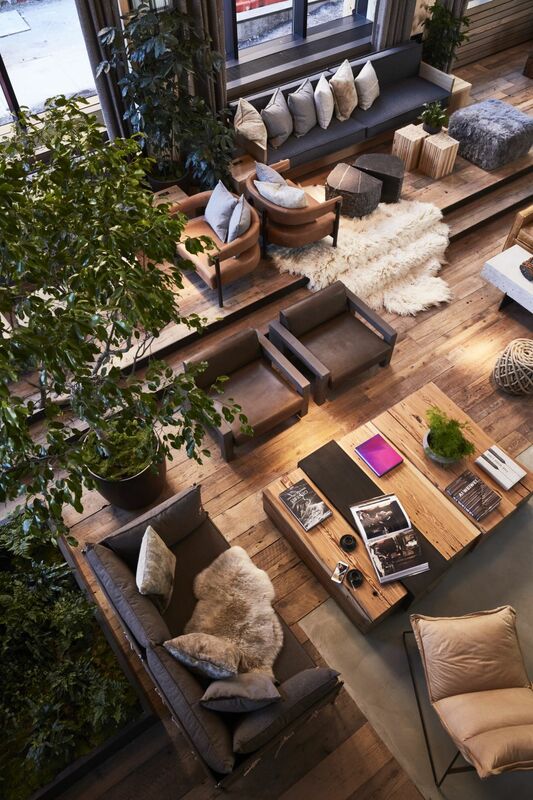 (Some even have hammocks.) 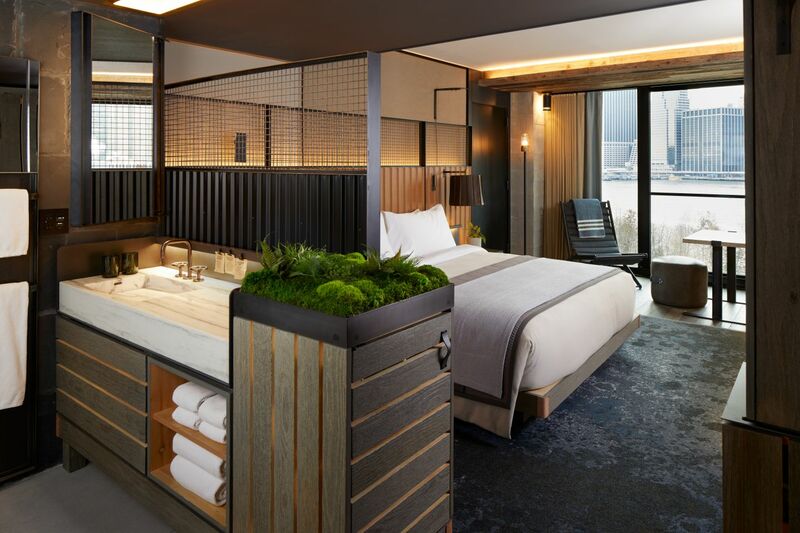 Coming soon: a 4,000-square-foot rooftop with a shallow pool along the south edge, tiered seating nooks, two fire pits, and a full-service bar. 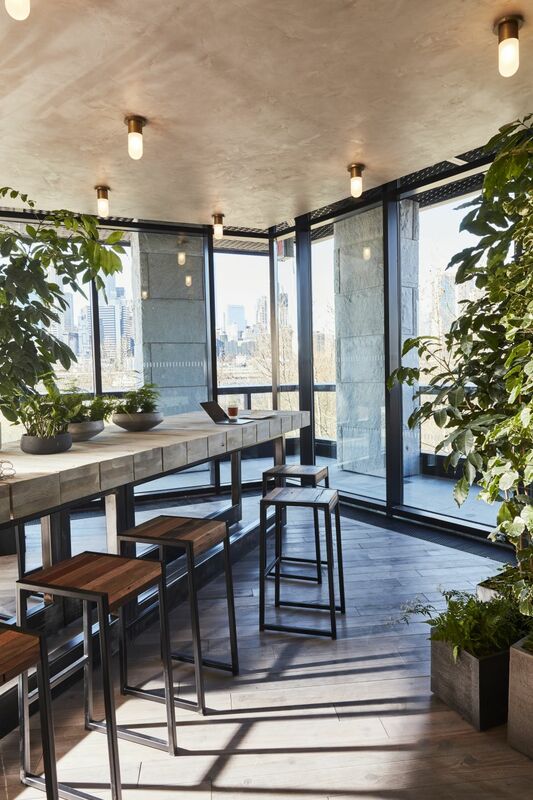 The roof deck also leads to a dark, intimate cocktail lounge on the floor below, which features a custom-cast silica bar made by Brooklyn sculptor and artist Fernando Mastrangelo.